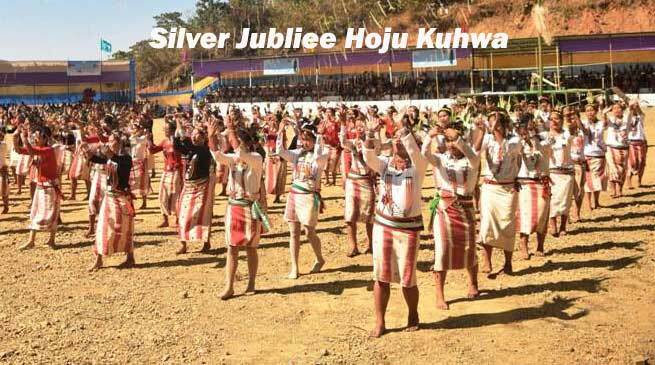 The Noctes of Dadam-ja people residing in various villages under Dadam Administrative circle of Tirap district celebrated their Silver Jubilee Dadam-ja Hoju Kuhwa from 2nd to 4th February with great enthusiasm at newly inaugurated Kamlesh Joshi Mini Stadium, Dada. While greetings to the people of Dadam-ja Takam Pario, Chief Guest and MLA-Palin urged the people of Dadam-ja to maintain aged old tradition and culture. Pario termed MLA-Tirong Aboh as proactive legislator for the developmental activities taken up within 2 years in the sector of Road communication, Education, Health and Cultural and Tradition preservation. He compared the 2 years development taken place in Dadam circle with 10 years activities taken up in other constituencies. Addressing the huge gathering Bordumsa-Dayun MLA Nikh Kamin praised the Tirap District Administration for the pro-active role played in the district in bringing many changes in the field of law and order saying that Tirap is now one of the peaceful districts in the state in spite of disturbance region been declared by government since 1999, road connectivity in Tirap District has been improved . He also appreciated MLA-Tirong Aboh for the all round development taken up in his constituency particularly in Dadam area. In his addressed Local MLA and President of Dadam-ja Hoju Kuhwa Silver Jubilee Celebration Committee Tirong Aboh highlighted about the Mythology of Dadam-ja Hoju Kuhwa been celebrated centrally at its Headquarter, Dadam adding that Celebration of Dadam-ja Hoju Kuhwa is unlike other harvesting festival based on Agriculture, he added that the literarily meaning of HOJU emanates from two words, “Ho” and “Ju” Literarily “ HO” mean Lean period of the year, and “Ju” means Celebration. Hence Hoju implies celebration during lean period of the year for pride and honour, and to show to the people of outside that only Dadam village could celebrate such an event like Hoju Kuhwa when the people were aggrieved by agrarian depression. Hoju Kuhwa is generally celebrated in different villages of Dadam area in the month of March every year and April, however the Dadam-ja Hoju Kuhwa was centrally celebrated under the aegis of DAYA “Dadam Area Youth Association” at H/Q, Dadam in the year 1992 wherein founding President was the then Shri Wangchat Sumpa of Huakan village and Secretary was the then Shri Wangdi Hakhun of Dadam village which was formally graced by the then former Minister Dera Natung and simultaneously in the year 1993 former Minister for Home Shri L. Wanglat was the Chief Guest at Venue: Huakan village. Aboh said that Culture and Tradition shouldn’t be mixed up with Politics, Creed, Caste, Region and Religion. As a part of 3 days Dadam-ja Kuhwa Silver Jubilee Celebration, Sports on Open to all Mini-Marathon Race for 5 km from Dapdong Residential School ground to Kamlesh Joshi Mini Stadium ground with a theme : Run for Culture and Peace for both Male and Female Category was conducted. Earlier on 2nd February,2017 Silver Jubilee Celebration of Dadam-ja Hoju Kuhwa was formally declared opened by Tirap Deputy Commissioner Ravi Jha.